With its two buttons, the compact AURUS-2 is a perfect companion in rooms with limited functions or where highest simplicity is expected. It features two buttons with white LED feedback, soft night-lighting, built-in Infra-Red receiver for remote control and a buzzer for acoustic feedback. The AURUS-2 also has a built-in temperature sensor for room temperature control. Although two buttons look limited, AURUS-2 is a very powerful panel. With your TELETASK remote control you have full access to air conditioning, audio control, etc... plus 24 customizable home automation functions. 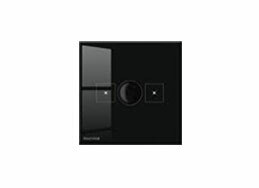 AURUS-OLED | Eight button glass design It features a high contrast white OLED display, eight buttons with white LED feedback, soft night-lighting, built-in IR receiver for remote control and a buzzer for acoustic feedback. All AURUS-OLED have a built-in temperature sensor for room temperature control. The OLED-display adds an icon and/or small text to every button to easily recognise the configured function behind it. The AURUS-OLED contains four pages. One main page and 3 extra pages, predefined as temperature control page, audio page and extra functions page. The configuration, like on all TELETASK touch panels and screens, can be changed in an easy way according to your wishes. 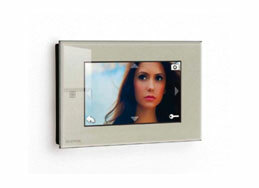 With the AURUS-TFT touch panel every function of the TELETASK system can be managed. Limits are hard to find. 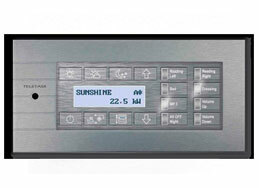 Although compact, the user-friendly menu system makes control simple and powerful. It uses carefully designed TELETASK easy-to-recognize symbols for the selection of lights, curtains, heating/cooling, energy monitoring, sensor graphics, scenes, audio, cameras, etc… Within a few clicks you can control about every light or other devices in your house. As an optional the AURUS-TFT 4.3 can be combined with a wireless DECT phone making it a full featured indoor video door phone device (over IP). LATUS touch window with slide-in custom printable legend (with text and pictograms). The label can be printed in colour on any printer. 16 buttons with WHITE LED feedback, night lighting, built-in IR receiver for remote control and built-in acoustical feedback. 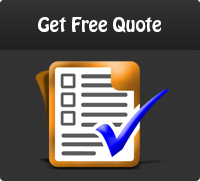 Highly customizable, easy to use and best price/performance ratio. 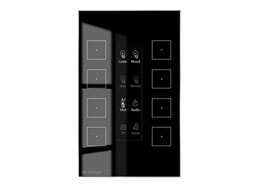 IR remote control with all necessary buttons to control any function available on the touch panel or touch window or touch screens you have. 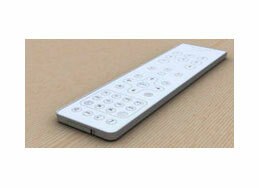 This IR remote control is extremely flat and has a glossy white housing. But there is more than only white. This new TELETASK remote control has powerful multi color control functions on top of the many domotics functionalities. For a limited number of functions you can also choose the mini remote control.